C&AHOME - 6 cube DIY Plastic Storage with Doors, bookcase and display shelf for adults, toy rack and personal storage organizer for lazy children and teen. Easy and simple assembly, could be assembled and disassembled multiple times. Frequently used as the closet storage divider, living or study room bookshelf, and toy racks for Children. As the manufacturer of our own products, your 100% satisfaction is the job purpose of our professional customer service. Do ask or contact us ahead of any inquiries. Returns: Returns are gladly accepted if item is not as described within 14 days of receipt. Free Parts: 3 month natural-destruction free parts replacement guaranteed. MATERIAL: Made from selected high-quality steel, eco-friendly PP material and plastic connectors. Waterproof and dustproof. Sturdy enough to bear 20lbs items. MULTIFUNCTION STORAGE CUBE: Perfect for storing books, documents, CDs, magazines, toys, art & craft supplies and other personal items in your office or bedroom. ASSEMBLY: Easy to assemble with no extra tools required. All it requires is a little bit of patience and a basic DIY comprehension. 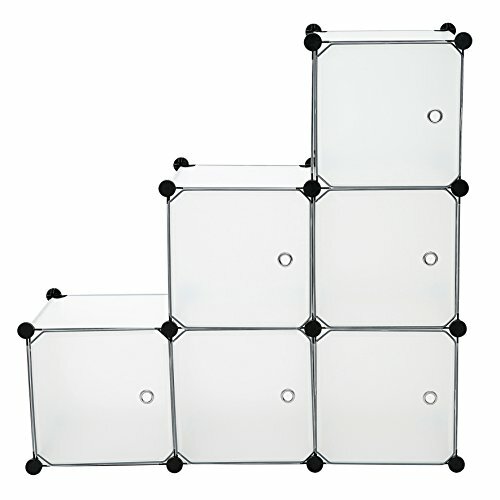 SPACE SAVING: Flexible size combination with 1-6 cubes, fits into the limited space of your room/office. Frequently used as the children bookcase, toy rack, and personal storage organizer, loved by both kids and adults. PRODUCT DIMENSION AND ITEM WEIGHT: 41.3*41.3*13.8 inches / 10.5 lbs. As the manufacturer we promise and take the full responsibility of each piece we sell. If you have any questions about this product by C&AHOME, contact us by completing and submitting the form below. If you are looking for a specif part number, please include it with your message. Portable Fridge Locker (7 1/2" x 11 x 7 1/2") Food Safe Box.